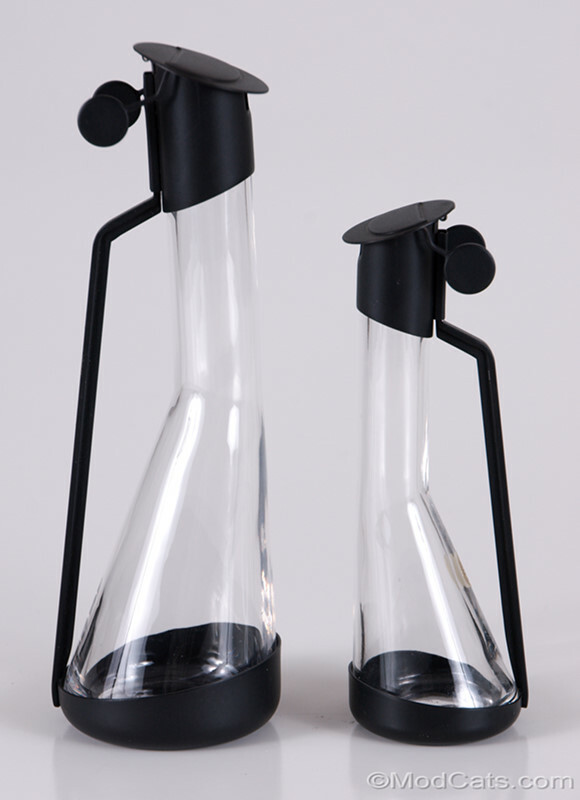 Alessi Oil and Vinegar cruets designed by Achille Castiglioni (1918-2002) in 1980 for Rossi & Arcandi group for Cleto Munari, licensed to Alessi in 1984. The lids are cleverly counterbalanced to open on their own as the cruet is tilted for pouring. The glass is lead crystal with all inox/stainless steel metal work. The vinegar cruet retains an Alessi label. Both bases are impressed with "Officina ALESSI Inox Italy". This is the only set we have seen with an original all-black surface finish.